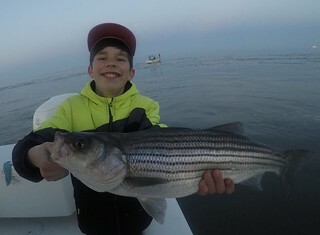 Saturday, April 20, marks the much-anticipated opening day of the 2019 trophy striped bass season. Captains and crews have been working overtime getting their boats ready for this weekend, from the largest charter boats to private boats parked on trailers in driveways. Good luck to all but be patient — many post-spawn striped bass are still making the journey downriver from their spawning sites. Mild temperatures in the upper 60s to low 70s are forecast for the upcoming week. However, expect some windy conditions for the next few days and rain Friday to mix the warmer main bay surface and cooler bottom waters. This will slow the water temperature increases up to or at the preferred spawning temperatures of striped bass and shad in the upper bay. The Maryland portion of the bay continues to have suitable oxygen conditions from surface to bottom. Bay salinities are still below average caused by continued above-average rainfall. As recorded at the real-time National Oceanic and Atmospheric Administration and Maryland Department of Natural Resources buoys, bay water temperatures are slowly rising and closing in on prime rockfish spawning temperatures of 60 degrees to 64 degrees. For the middle to upper bay, from Thomas Point to the Susquehanna Flats, water temperatures are rising to the mid- to high 50s. For the middle to lower bay, the NOAA Gooses buoy is holding in the high 50s at the surface, while the bottom temperatures have increased to 50 degrees due to wind mixing. Choptank River area water temperatures are also holding at the upper 50s to low 60s. For the Potomac River, surface water temperatures are holding around the mid-50s while water temperatures upstream near Little Falls have climbed to 64 degrees. At this time of the year, surface waters are now warmer than most bottom waters. Expect good water clarity in most places of the bay except on the Potomac River from Quantico down to Colonial Beach, on the main bay from below the Susquehanna Flats down to the Patapsco River, and also on northern Tangier Sound and nearby rivers. Expect slightly rising flows for the Susquehanna and Potomac rivers due to recent rains farther up in the watershed. Smaller rivers and streams entering Maryland’s portion of the bay will be normal, but likely rising due to predicted rains on Friday. There will be above average tidal currents all week as a result of the upcoming full moon April 19. Those wishing for some catch-and-release striped bass action in the Susquehanna Flats should enjoy plentiful action with school-sized male striped bass. Jigging and casting a variety of swimbaits, crankbaits and topwater lures will offer light-tackle action, and there is hope that a few large female striped bass have arrived in the area. Water clarity conditions are generally good due to moderate flows from the Conowingo Dam, and water temperatures are improving. White perch are moving into the lower Susquehanna River. Hickory shad are being caught in the river and they could make their spawning runs up Deer and Octorara creeks later this week. Smallmouth bass are active in the river and can be caught on a variety of jigs and swimbaits. There will be some limited opportunities for catching large striped bass above the 35-inch minimum this weekend in the upper bay waters below the Brewerton Channel. The steep channel edges off Love Point and Podickory Point will offer the best chances of hooking up with a large striped bass, but anglers can expect most of these fish to be pre-spawn females headed to the Susquehanna spawning sites. Surface water temperatures are around 57 degrees at the Gooses and colder on the bottom. Striped bass moving up and down the middle bay on opening weekend of trophy season will most likely be close to the surface until boat traffic drives them down. Most of the large striped bass encountered while trolling this weekend will be pre-spawn females headed to the Susquehanna Flats spawning sites, but there is hope for post-spawn striped bass leaving the Choptank River. There has been fair-to-moderate spawning activity on the upper Choptank for more than two weeks and some of those fish should be exiting the river by the weekend. The False Channel and other steep edges near the mouth of the Choptank like the edge off of RN”2 and the inside steep edge of the CP Buoy is where I’d place my bet. The steep channel edge at Bloody Point, Breezy Point and Thomas Point will get a lot of attention from those trolling. Tandem-rigged large parachutes and bucktails dressed with sassy shads large enough to fillet will be in order, and chartreuse will be a favored color due to stained water conditions. Planer boards are one of the favored ways to troll but if you’re in a small boat trolling flat lines, be sure to let them be in what is called “the way, way back” location far behind the boat. That way baits are more enticing to motor noise-shy striped bass. Catch-and-release fishing has been good at the Calvert Cliffs Power Plant warm water discharge for those jigging with large soft plastic jigs. There will be the possibility that one may be lucky enough to tangle with a striped bass over 35 inches this coming weekend. White perch continue to move down the tidal rivers, headed for their summer habit in the lower sections of tidal rivers and creeks. Fishing for white perch and channel catfish continues to be good at Bill Burton Fishing Pier State Park. Anglers should note this popular fishing destination is available to anglers from 7 a.m. to sunset every day. After being closed for several months to remove aging and dangerous overhead lighting, both the Talbot County and Dorchester County piers have reopened, but for public safety night fishing is prohibited. Access for shoreline fishing on the Talbot County side of the park remains available from sunrise to sunset. The lower bay region will be one of the most popular and often productive places to fish on the opening weekend of the spring trophy striped bass season. Large post-spawn striped bass will be filtering out of the Choptank, Nanticoke, Patuxent and Potomac rivers, and they all have to pass through the lower bay on their way down the Chesapeake Bay to the Atlantic Ocean. Trolling tandem-rigged parachutes and bucktails off planer boards, or similar lures on heavy inline weights off flat lines will be in order for most boats, especially the charter fleet. Most likely it will be a typical opening day with a slow pick. Some of the traditional locations where steep channel edges occur will include Cedar Point, Cove Point, Point No Point, Smith Point and the channel edge between St. Georges Island and Piney Point on the western side of the bay. Locations on the eastern side of the bay worth checking out include the channel edge between Buoys 72 to 76, Hoopers Island Straits and the eastern channel edge of Tangier Sound off Deal Island. If you’d rather look for more peaceful surroundings then trolling with the fleet out in the bay, there are some exciting options in the tidal rivers. In the tidal Potomac from the lower region all the way up to the Wilson Bridge there are scores of blue catfish to catch. The Nanticoke River near the Sharptown area is another great place to catch blue catfish. Fresh cut bait of gizzard shad or white perch are popular fish to use for bait. 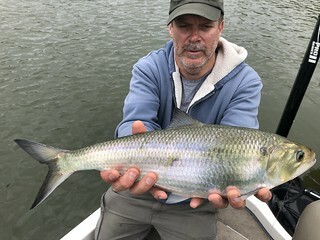 At the Fletchers Landing area of the tidal Potomac in the District of Columbia there is excellent catch and release fishing for hickory shad and American shad. Shad darts, colorful flies and small gold spoons have been popular lures to use. The 2019 cobia regulations are out, and here is where anglers in the lower bay region will stand this year: The season will run from June 1 through Sept. 30, with a 40-inch minimum and a limit of one fish per day per person. Also there is a three-fish limit per vessel per day, no matter how many anglers are on board. Crew from the state hatcheries are busy this week stocking thousands of trout in management waters across Maryland. Water flows have been good in most areas and cool water temperatures have created an ideal environment for the trout. Warm weather is also advantageous for fishermen young and old. This is the best month for trout fishing in the put-and-take areas so do not miss out. Check the stocking schedules and stocking updates and get in on the action. The delayed harvest, fly-fishing-only catch-and-release trout management areas are a wonderful place for fly fishermen to enjoy some peace and quiet casting nymphs or streamers, and also for those new to the sport to be able to hone their skills. Fly fishing in the put-and-take areas is a lot of fun, and drifting nymphs or working streamers or woolly buggers is a great way to catch and bring home a few trout for dinner. 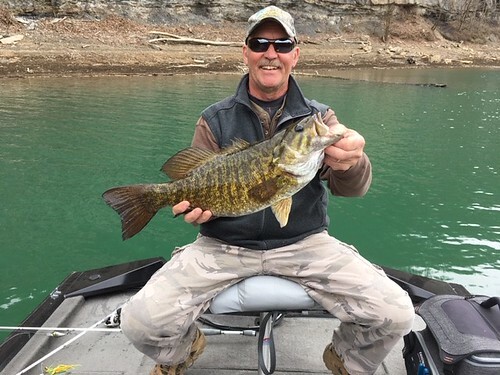 Warmer water temperatures are causing smallmouth bass to become more active in Deep Creek Lake, Jennings Randolph Reservoir, the upper Potomac River and the lower Susquehanna River. A variety of small soft plastic jigs, spinnerbaits and crankbaits are three of the most popular lures to use at this time. Largemouth bass in many areas of the Central, Southern and Eastern regions of the state are entering their pre-spawn mode of behavior. The male largemouth bass are now in the shallower spawning areas carving out spawning beds. 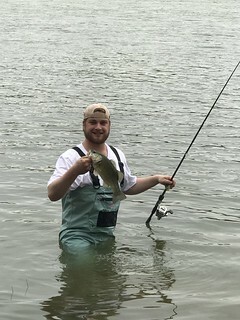 The larger female largemouth bass are holding in slightly deeper water or transition areas gorging on crayfish or any type of baitfish they can find. Often they will be holding near structure such as sunken wood. Craw jigs, grubs and crankbaits that resemble crayfish are a great choice when fishing around sunken wood, rocks or creek mouths. Spinnerbaits can be a good choice also along the outside edges of emerging grass and a great way to cover a lot of water. In the tidal rivers of the middle and lower Eastern Shore, spatterdock and pickerel weed fields are forming; casting spinnerbaits along the edges of these fields during a falling tide is a great way to target largemouth bass. Fishing for crappie in the many ponds, lakes and tidal waters of Maryland continues to be very good this week. Targeting brush piles, fallen treetops, marina docks or bridge piers is a great way to find them where they tend to hold tight to structure. In some of the lakes such as Unicorn and St Marys, fisheries biologists sank old Christmas trees to form crappie holding structure for fishermen. Small minnows or small jigs under a bobber are the best way to catch them. 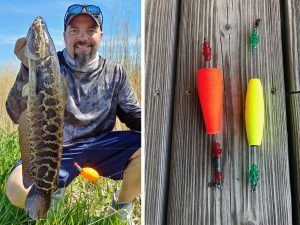 Fishing for northern snakeheads continues to be excellent as their populations in Dorchester, Somerset and Wicomico counties greatly expand in numbers and range. 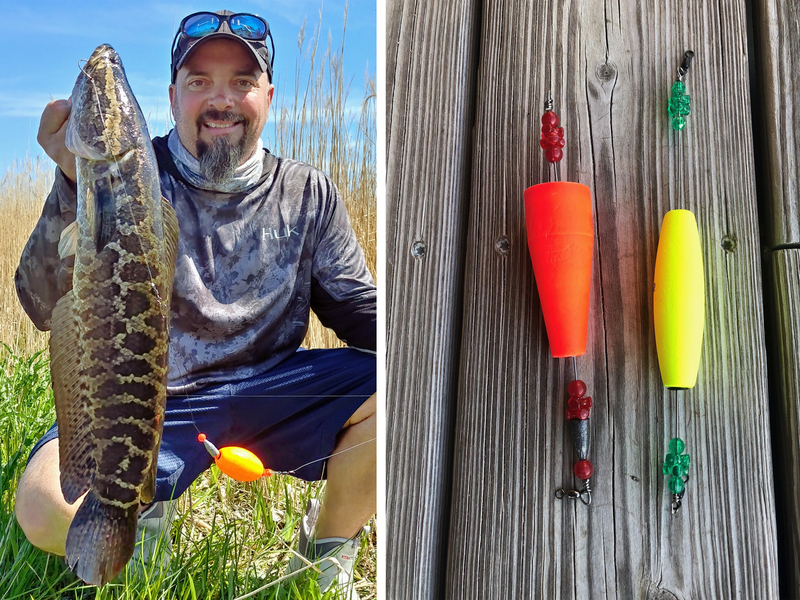 Typically the most common way to target northern snakeheads has been to cast buzzbaits, since they are attracted to noise, but a whole new way of fishing for northern snakeheads has developed recently. Local fishermen have taken a cue from their southern neighbors where popping corks that contain rattles with a shrimp trailer are used to catch redfish and speckled trout. The results have been astounding in the number of northern snakeheads being caught. A large minnow is lip-hooked and placed about 12 inches or so behind the popping cork. Once cast out the cork is slowly worked with pauses along likely looking water; the snakeheads cannot resist the noise and offering. The department has put together a new website containing a lot of good information about northern snakeheads. Water temperatures near the inlet and beaches currently are about 50 degrees. Surf fishermen are catching some nice black drum on bottom rigs baited with clams. 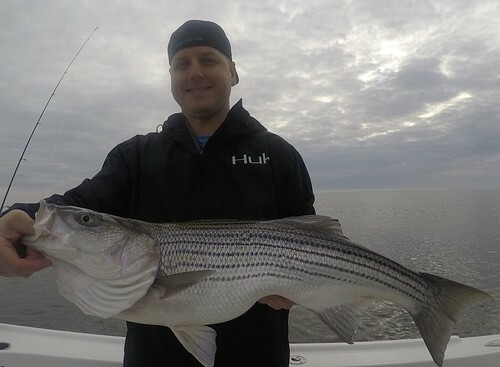 A few striped bass short of 28 inches are also being caught on clams and cut menhaden baits. The first kingfish are beginning to show up along the beaches and can be caught on bottom rigs baited with bloodworms. At the inlet and Route 90 Bridge areas, striped bass are being caught by casting bucktails and swimbaits. Almost all are just shy of the 28-inch minimum but a few legal striped bass are being caught. Flounder are moving through the inlet attracted by the 60-degree water pouring out of the back bay areas. The best fishing has been on a falling tide at places like the Thorofare, with limit catches occurring. Large minnow and squid baits as well as Gulp baits have been the best way to catch the larger flounder. Offshore the focus has been on tautog fishing at the wreck and reef sites. When currents bring warmer waters over the wreck and reef sites the bite can be very good. Warming waters will eventually bring tautog into shallower waters and the Ocean City Inlet where shore-bound anglers anticipate their arrival. As dead and cold as any stone. He took a cold, which stopp’d his breath.